We love helping charities raise money. We work with charities UK-wide to help you engage your supporters, raise money and have great fun along the way! We give your supporters the chance to challenge themselves in the outdoors whilst learning a brand new skill and seeing the world from an entirely new perspective. Your organisation is individual and we can customise your event to your requirements. We’ll start by meeting with you to discuss your goals. We’ll then work with you to turn these initial ideas into a highly polished event tailored to your brand. Whether it’s a race or challenge, river clean or tour, we’ll ensure your event is super fun, safe, sustainable, and sure to get your supporters on board. Safety is our top priority and we take our responsibilities very seriously. We are one of the UK’s leading SUP schools, a Water Skills Academy Centre of Excellence, and in the winter season you’ll find us all over the UK training the next generation of instructors. We are fully qualified, licensed and insured (£5m public liability). Copies of our insurance certificates, operating procedures and risk assessments are available on request. 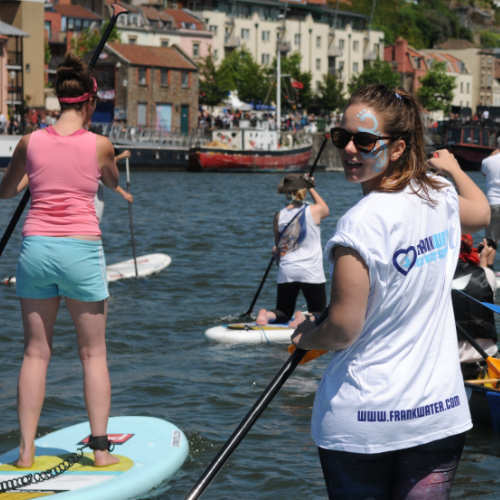 Our stand up paddleboarding events are a brand new, exciting way to help your supporters to raise money for your organisation. Your supporters see their city from a new perspective, and learn a new skill whilst being active in the outdoors. SUP is an accessible sport for people of all ages and abilities and our events are also a brilliant opportunity for team building and networking with colleagues and clients. RNLI are the charity that saves lives at sea through lifeboat search and rescue, lifeguards, water safety education and flood rescue. RNLI crews and lifeguards have saved over 142,200 lives since 1824. We have run the RNLI SUP CUP since 2016 and raised over £10,000 for the charity. FRANK Water is a leading safe water & sanitation charity. Since 2005, they’ve provided safe water & sanitation to 386,500 people in 442 communities. The small organisation aims to address a big problem, providing safe drinking water to the 663 million people worldwide who still lack access to this basic human right. Read more about FRANK Water.